In this 2014 file photo, Command Center monitoring of the Health Connector web site that was launched last year. 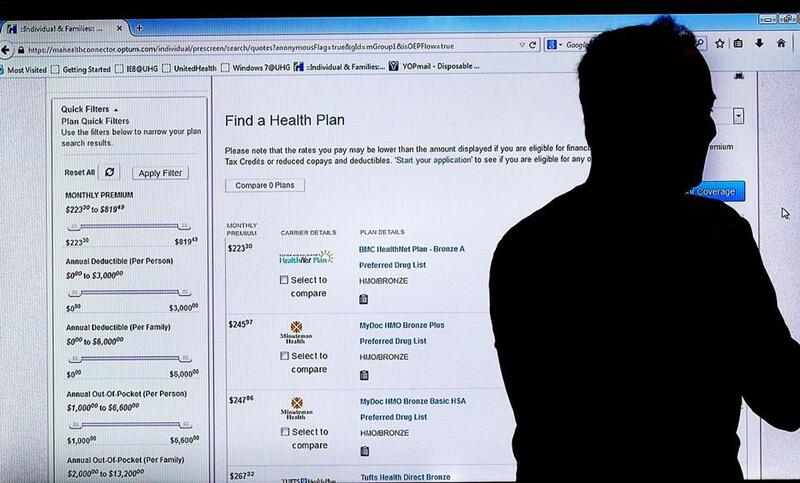 The first 11 days of enrollment in the Massachusetts health insurance marketplace have gone smoothly, officials said Thursday, raising hopes for the state’s third attempt to launch a well-functioning website. “I feel positive about the open enrollment start,” Louis Gutierrez, executive director of the Massachusetts Health Connector, told its governing board at its monthly meeting. The Connector, which serves people who don’t obtain health insurance from their employer, has suffered from technical and customer-service problems since 2013. Since Nov. 1, the Connector has received applications from more than 2,000 people and determined their coverage eligibility. Gutierrez said that number is about what he expected in a year when the vast majority of current enrollees can keep existing coverage. The website has functioned well nearly all the time, officials told the board. There were three outages, each lasting a few hours; two were caused by problems related to the federal government. ■ Of the 20,064 calls to customer service centers, only 80 (0.4 percent) hung up before speaking with anyone. Last year, 25,414 called in the first seven days and 4,366 (17.2 percent) abandoned the call. ■ Consumers this year waited an average of 14 seconds for a customer service representative to pick up the phone. Last year, the average wait during the first week was nearly three minutes (and rose to an hour or more later in the season). During open enrollment, from Nov. 1 through Jan. 31, individuals seeking insurance can go to www.mahealthconnector.org , find out what kind of coverage they are eligible for, select from a menu of health plans, obtain state and federal subsidies to help pay for premiums, and enroll in a plan. A cadre of “navigators” located at health centers and elsewhere provide assistance. The Connector also has six walk-in centers. “We’re really pleased with the enrollment process this year and the consumer experience,” said Amy Whitcomb Slemmer, executive director of Health Care for All, an advocacy group that runs a help line for people seeking insurance. The quiet open-enrollment launch this year contrasts with the two previous years. In 2013, a new website built to meet the terms of the Affordable Care Act was unable to determine anyone’s eligibility and functioned so poorly it had to be discarded. In 2014, a refurbished website signed up tens of thousands of people but had difficulty processing payments and making changes. Many people paid for coverage but were never enrolled in a health plan — and then spent many hours struggling to straighten it out with overwhelmed and sometimes ill-informed customer service representatives. Vicki Coates, Connector’s chief operating officer, is still trying to clean up problems from last year. Since the beginning of the year, her team has resolved 3,639 cases, with 244 to go. A new “ombudsman” program enables people to connect online with Coates’s staff when they cannot get their problem fixed elsewhere. Coates said she reads every letter to the ombudsman, at: www.mahealthconnector.org/about/contact#contact-ombudsman. Cases that involve reinstating coverage and providing retroactive reimbursement are especially thorny and time-consuming, Coates said. Ann Marie Sessler has one such case. Despite paying premiums, she has been unable to get health insurance for herself, her husband, and two college-age daughters since March. Sessler recently wrote to the ombudsman but, despite promises, still doesn’t have coverage. Connector spokesman Jason Lefferts said in an interview Sessler’s situation will be fixed by next week, with her coverage restored retroactively to March. Ame Enwright of Leominster also recently turned to the ombudsman after her insurance was mistakenly dropped, leading to hours of fruitless calls. Enwright, a 59-year-old medical transcriptionist, appreciated being able to speak with the same “very nice” person in the ombudsman’s office every time. But although she was given an insurance number Wednesday, when she went to buy supplies for her type 1 diabetes, the pharmacist said her insurance was not in effect. “It’s just been a terrible nightmare,” Enwright said.